Not The Barnet Times: Has Brian Coleman been silenced? Barnet Council Watch detests censorship. Freedom of expression is a central tenet of a democratic and civilised society, so when the Barnet Times removed one of Rog T’s blogs from their web site, it was republished here in full. The same fate seems to have befallen a press release issued by Brian Coleman which has mysteriously disappeared off the GLA website. The circumstances surrounding this story can be found on the Tory Troll blog. Rog T and Brian Coleman are poles apart politically, but they both have strongly held views which they are not afraid to express in forthright terms. Barnet Council Watch defends their right to be heard, even if we disagree with much of what they both have to say. 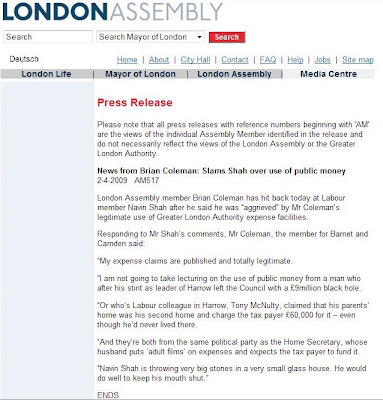 Therefore we are republishing Cllr Coleman’s press release unedited so that you can read it and decide for yourself whether you think he is the best politician in London or an overpaid egotist with a big mouth. He hasn't been censored this has been removed because it is highly political and use of resources guidance means that GLA resources (staff, IT systems, telephones) cannot be used to do it. No, you are right, this is WAY more serious than just being censored. Action has been taken to stop the use of GLA resources for party knockabout purposes. This could go very badly wrong for Mayor Marmite. Anon, if you are correct that the press release was removed for being an abuse of taxpayers resources, then surely the Leader Listens blog should be similarly axed? There is, of course, nothing to prevent Brian Coleman from starting his own blog on Blogger, which wouldn’t cost taxpayers a penny, and would be out of the reach of petty fogging bureaucrats and their big red pens. "he would do well to keep his mouth shut"
oh that he would take his own advice. clarrieB - I'm afraid that what you propose is quite impractical. If Councillor Coleman were to keep his mouth shut, where do you suggest he should put all of his free meals?